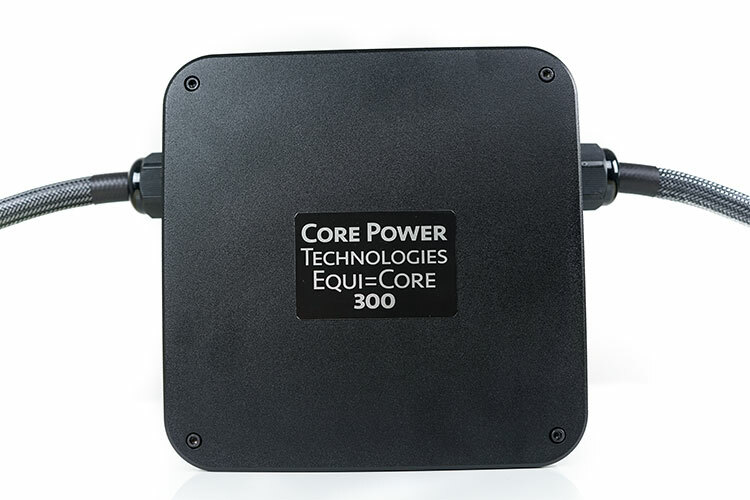 The Core Power Tech Equi=Core 300 is what is known as a balanced power conditioner, weighs a ton and according to their loyal customers a bit of a game changer when it comes to modern-day power conditioning products for audio systems. In theory, we could do with one of these in our office like yesterday. Core Power as a company started a few years back and is headed up by Mark Schifter. They are currently based in Broomfield, Colorado, and ship to anywhere in the world. This is not a new company though. The product name is Equi=Core and those into power conditioning will know right away that this is drawn from balanced power pioneers, Equi=Tech. Quite a lot of Equi=Tech products are commercial or large scale for multiple appliances and not necessarily that focused on our hobby. What Core Power did was create a partnership with Equi=Tech to develop a range of balanced power conditioners with specific wattage ratings that they felt was more in tune with audio consumer needs. The Equi=Core 300 was the first such product launched after a one-year research and trial period. Since then Mark and his team have expanded the product range but it was the 300 that got them going. Pricing depends on the length of power cord and starts at $799 for the 2.5ft and $899 for the 5.5ft cord edition. The Equi=Core 300 uses something a bit different from other passive conditioners called balanced power technology. Now, this principle or design behind balanced power is really no different from how we perceive balanced power outputs on our audio systems and the benefits it can bring, namely lower noise levels. 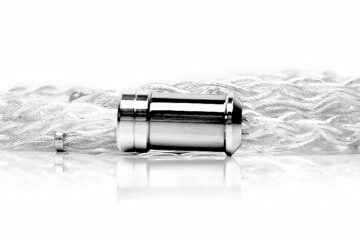 Our typical 3-wire mains design and the delivery of power to our audio systems are unbalanced. It has been like that for decades. The usual is one wire hot for voltage (120v or 220v etc) and neutral and ground have zero voltage which means common harmonic and reactive currents build up on neutral wires and grounding circuits. Loose current can transfer into the grounding chassis of audio equipment from the hot side and will degrade the grounding capability. Throw in modern day electrical interferences such as RFI and you start to see how noise can easily circulate in any circuitry using a standard power supply. The Equi=Core 300 is a custom designed toroidal balanced transformer that splits the 120VAC supply (or 240VAC depending on which you ordered) into 2 out of phase 60V (70V) halves and drains the common mode noise off to a ground when the two are recombined. This should result is a lower noise floor, with better dynamic range as a result and more audible low-level detail in your standard analog amp attached to it. Also, Core Power is very careful to state that this is done without major filtering or altering of the sound signature (particularly dynamic range) you get as a result which can happen with some passive regular power conditioners. Not just one amp either. Mark and I discussed this during our email sessions. The 300W ability of the Equi=Core 300 means you can combine up to 300W but never go beyond or else you start to get some problems when exceeding the maximum load. Thus, with a good socket board, you can actually run two to three analog or digital devices up to the maximum rating and still get the benefits. Well, it ultimately depends on your system setup, budget, and your power supply. If you feel you have a very low noise floor already and working on a tight budget then perhaps this is not for you. However, if you run some heavy duty power amps, speaker systems, and even mission-critical high-end headphone setups either as a pro or enthusiast then the price point may seem reasonable. If your mains supply is bad or shared by many other appliances where the hum is an issue this solution may be for you. Other balanced power conditioners can cost up to 4-5 times as much such as the Furman balanced power conditioner range so in context this may seem like a good deal for those that feel they need something like this in their setup. I would even recommend you simply try it out. Ignorance is bliss sometimes, you may not realize how noisy your system is until you plug it in or it may confirm you are already well set up and do not need one. The Equi=Core 300 is actually a little smaller than I had anticipated but boy is it much heavier at almost 15lb. This something you will want to put on a steady flat surface for sure. The form factor is squarish in design measuring in at 20cm x 20cm x 9.5cm and all the corners are nicely rounded off with silver coated aluminum plating. The 6 main panels are finished in black and bolted together with some heavy duty torque screws. At the center of the base is an opening with a very large bolt sticking out. This, I presume, holds the toroidal transformer securely in place. Give then rather uniform form factor and rock solid build quality you can lay the 300 flat or on its side and it will remain fairly stable. However, Core power have supplied 4 rubber feet that screw into the back panel meaning it is really intended to lay flat on your surface of choice. 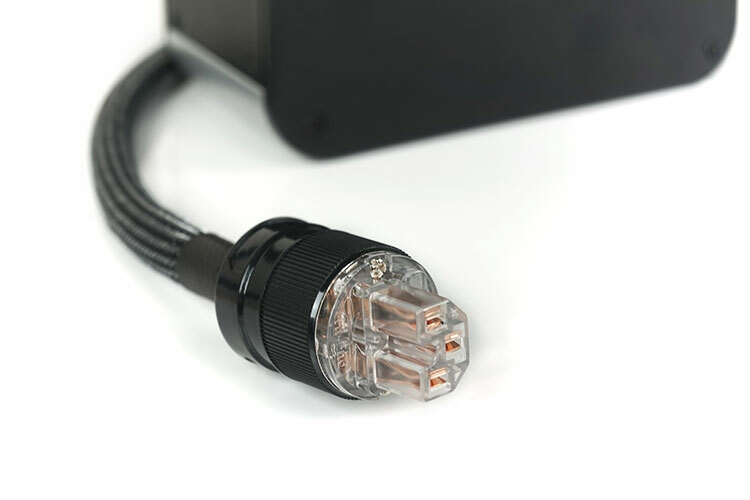 On each side of the 300, you get two non-detachable heavy-duty inlet and outlet 3-prong power cords. From what I can deduce these are configured to handle balanced power with copper plated male and female IEC connectors. They seem to have a heavy-duty isolation wrap and also finished in a durable nylon jacket. These are thick cables, but no thicker than typical ones you will see out of the back of a good amp at a trade show or in a good quality setup. You can buy the 300 with varying lengths of cable from 2.5ft, 5.5ft, and 8.5ft. This particular unit is the 5.5ft which is more than enough for our own tall rather than wide setup. The flex in the cable is not huge by the way but there is enough memory retention to get it to where you want to go. Just bear in mind that the arcs in the cable bends are not that tight so leave plenty of room at the back of your system to compensate. Unless Core Power have substantially upgraded their presentation since I got mine all I can say is that it is fairly industrial but more than adequately packed for long journies around the world. This is a strengthened brown courier box with plenty of blue foam packaging on all sides and contoured to fit the cables. Not much else comes with it apart from the 4 rubber feet and plastic overs for the copper plated IEC connectors. I would have liked to have seen a small leaflet of some kind regarding the product. This could include specifications, safety warnings and installation scenarios for first-time power conditioner users. Also, a little something about balanced power in principle would be a nice touch. 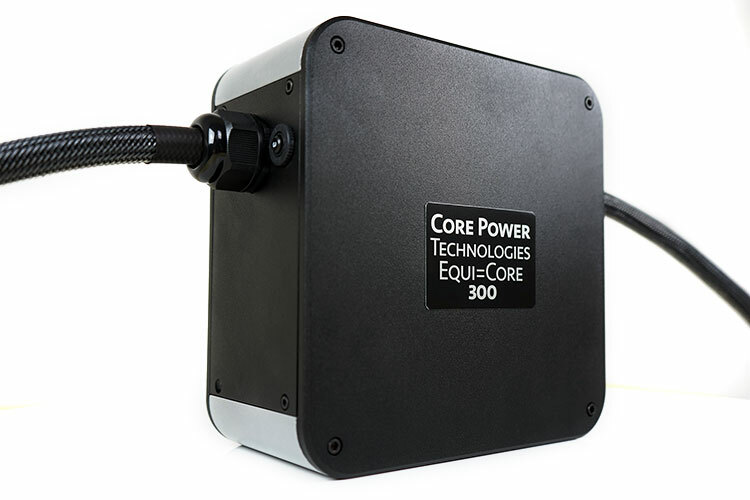 Given the Equi=Core 300 is a 300W capacity power conditioner, you can technically plug the inlet end into the main and run a power board from the outlet IEC connector and load up to 300W of product ahead of it. This may be one, two or more products depending on their ratings. Having said all that my preference is to target my analog components one by one with either the one I use most as a point of reference or the one I think would benefit the most. In this case, the Xi Audio Formula S amp which is a single ended high-end designed headphone amplifier rated at 6W into a 16Ω and a rated noise floor of -110 dBV. This choice is based on the quality of chain in terms fo dynamic response. My second choice was an analog turntable/project audio phono stage/tube amp configuration where I think noise might be most prevalent. Given its weight and cord length, I would also not advise pushing it too close to the source devices. Ideally, you want to prevent any possible magnetic field interference with the operation of both devices. The Formula S is a single-ended or unbalanced designed high-end headphone amplifier from Xi Audio. Its a stunningly natural sounding solid state amp with a fantastic level of resolution and not a harsh peak to be found anywhere. It’s 6W into 16-ohm rating and excellent noise floors should deliver tons of power when required but it is also sensitive enough to work well with headphones like the AKG K872 and its 36-ohms rating. Pre-amping usually works best for fine control of this beast. My usual connection is via a 2000Va AVR from the mains to line conditioner and then typical 3-prong cord to the amp. The amp takes a feed from the Chord Hugo 2 which is battery powered and a USB connection to the PC for digital audio. In normal circumstances, this setup will have very low noise to begin with so I am not looking for ‘hum’ or hiss issues using the Equi=Core 300. Rather I am looking for any perceived change in the background and dynamic response during playback. Did I get it? Yes, I did, I have no doubt on that one but it is more nuanced than that might suggest. Let me give you an example, Alyn Cosker’s “Twitter And Bisted”, a post-modern jazz track with a strong focus on percussion and brass sound clear and precise using our regular setup. With the Equi=Core 300, the brass and sax passages were that bit snappier and more engaging. There was no tonal difference with either setup which was important to me so you are not looking at a sea change in presentation. The instrumental separation was also a little better and the staging, in general, had a more holographic feel. Another great example is the Flute Concerto: II. Alla Marcia with has some complex flute solo works interchanging with some sweeping string and orchestral drum sequences. There is a lot of explosive variation in pace and aggression in that 3-minute track. In short, the dynamics were just excellent and not a detail was missed. In my regular setup, my perception of the flute passage was just a little flatter sounding than the Equi=Core 300 setup. The Equi=Core 300 did a better job capturing the micro-details during heavy drum rolls whilst retaining a solid rendition of the flutes airier tone passing over it. The ALO Audio is a Class-A single-ended triode (SET) circuit design and for me, the Equi=Core 300 is tailor-made for these type of headphone amps, perhaps more so than the Formula S which is already a very quiet solid state. SET’s can deliver a lot of noise if not set up correctly. The Studio 6 in this instance is part of a Project Audio phono stage and a Rega RP3 turntable system and has no digital audio connectivity. Now just to be clear if you stick a very low impedance headphone into this setup you will hear the noise, regardless of using the Equi=Core 300 or not. 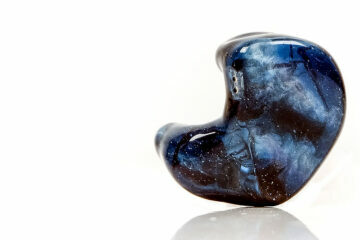 This is a 3-input, 4 output unbalanced design and its quiet with planars and less efficient headphones. Using something like the 36-ohm AKG K872 I picked up noise and hum regardless of cords, connections, and conditioners. Using the HE1000 V2 planar from Hifiman was a whole different ball game though. I got a very clear and clean performance and absolutely no hum or noise other than the cracks and pops inherent in the records being played. The sound was sublime. On the regular setup after prolonged play, I used to get a bit of hum. I figured one of the input source units had poor grounding and was getting in via the RCA inputs. Surprisingly, the use of the Equi=Core 300 proved ineffective against this random hum issues also until I isolated the system from contact with other source inputs. Once isolated the background was as black as you could imagine for a SET/analog design. It also reminded me I need to clean the vinyl a bit better! A con, but a good con. Our test track was Christopher Cross’s Deputy Dan off the excellent Cafe Carlyle Sessions. Its a naturally smooth sounding recording to begin with a firm focus on vocals, piano, and some acoustical arrangements. And once again the leap in dynamics was excellent. This was not such a nuanced difference this time either. Vocals, in particular, sounded more lifelike and engaging and everything sounded wonderfully transparent. The 300 pulled no filtering monkey business on core sound of this setup and I enjoy it all the more for that. My experience is with the Equi=Core 300 it was an extremely positive one. However, I cannot assume your setup is the same as mine, nor can I assume that you have problems such as noise with your setup. You may already have excellent noise control so I have to go back to my original thoughts on the pitch on who is going to enjoy this setup. This review is really targeting those with high-performance systems and those who want every last drop in micro detail and dynamic range possible from their amps using either headphones or speaker systems. The difference the Equi=Core 300 makes ranges from nuanced in the case of the Formula S solid state amp to completely satisfying in the case of the SET Studio 6. From my perspective, the SET analog match-up brought the most immediate benefits in terms of noise and dynamic range improvement and that is likely where the unit will stay for the foreseeable future. Quite apart from the audible improvements I have to give special praise for the design and materials. This is one heck of a durable piece of hardware and it looks quite nice also. The cables are well shielded, nicely finished and more than a few times people have just stopped and stared at it wondering what it is. Is the price good value? Contextually I would say yes. One look at, say the Furman range at up to $3000 for balanced power and $799 becomes a very good deal for those with very high-end expensive systems. For headphone users, the same will apply and I do encourage you to at least demo it and see what it can do for your system’s performance.